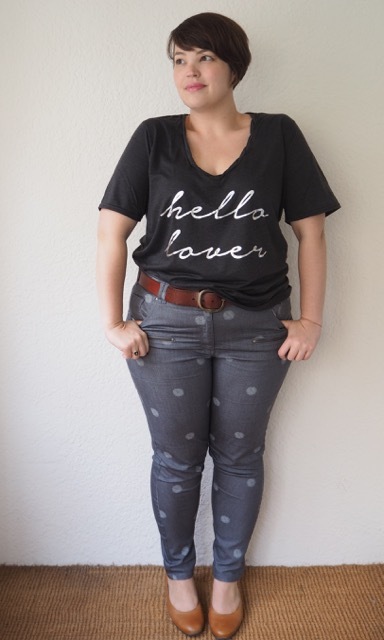 I’ve been seeing this awesome “Hello Lover” t-shirt doing the rounds lately, which means that there’s probably a few bloggers like me who saw gorgeous Jojo of iCurvy rocking it on her blog, and decided that their wardrobe wasn’t complete without it. It’s the most wonderful fabric; butter soft with a beautiful drape. The foil text shines against the heathered grey tee in a not-too-over-the-top fashion, and the wide twisted neckline and relaxed fit give it an air of casual chic. It’s been made by the Australian company “Ruby And Lilli” (and with a store name like that I really didn’t have any other alternative but to buy it, right?) 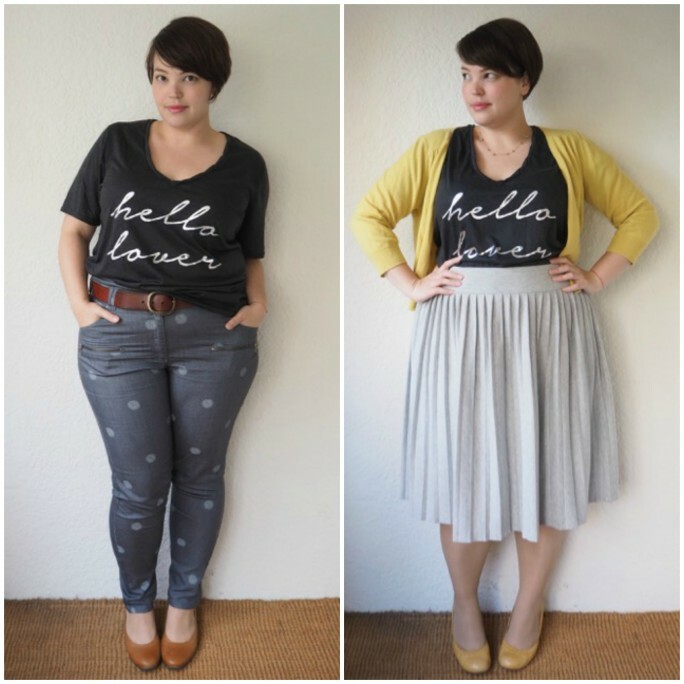 who specialise in on-trend t-shirts designed to flatter the fuller figure. The site is easy to navigate, the shipping was super-quick, and my t-shirt arrived wrapped in tissue paper with a lovely little handwritten note encouraging me to visit the Ruby And Lilli Instagram page for inspiration on how other customers have styled their tees. 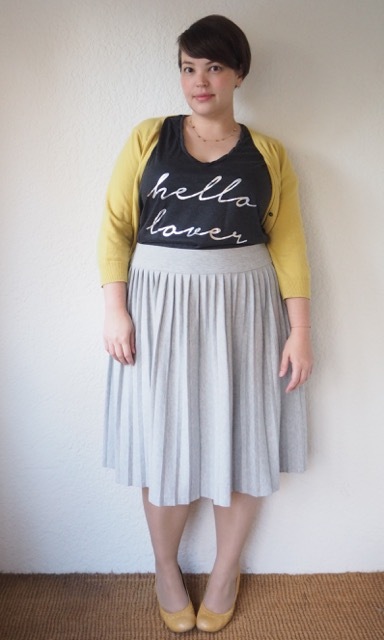 OK, so with the slogan “Hey Lover” it’s not really an office-friendly tee-shirt, but it does look pretty elegant with the grey skirt picking up the silver in the text. The addition of the cardigan makes the tee-shirt part of an outfit, rather than being the statement piece that draws all the attention. Because the skirt is so voluminous I’ve tucked the top loosely into the waistband giving the outfit a bit more shape. Because the top is oversized you get a slight blouson effect that allows it to stay relaxed, but the waist gives the outfit a bit more polish. My second Two-Ways outfit is a lot more casual. It’s a great weekend ensemble – the slouchy statement tee-shirt teamed with a pair of comfy skinny-leg jeans. I’ve half tucked the t-shirt this time, which helps to maintain my proportions and elongate my legs without sacrificing the relaxed effect of the t-shirt. I added a belt and a pair of low tan heels to break up the grey. If you have your eye on this – or any of the other tee-shirts on offer at Ruby And Lilli – I’ve encourage you to put your order through soon, as they seem to be having a sale right now, and all the t-shirts are priced at $25, down from $45! This entry was posted in Uncategorized and tagged asos, boden, carmakoma shoebuy, cool, Ruby and Lilli, seychelles by lillipilli. Bookmark the permalink. Love your hair and style! The hair is so great! Ahh inspiring me to chop mine too. Seriously, so flattering on you! Thanks Maggie! It was a bit nervewracking getting it done, but I’m really happy with it now! Despite the word lover being on my “words that make me cringe” list, I love this look! The silver pops out so well without being too bright, and the fit of that top is perfect. You are so totally my idol!! Thanks Molly! 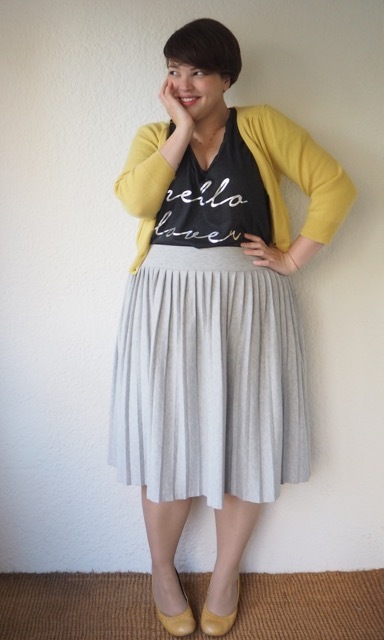 I bought “Magnifique” for my second tee – I’ll be able to wear that one to work, yay! It looks like there’s going to be stripes in the new season… STRIPES. Very happy about that! Hey Emma – Yep, there’s a bit of stretch, just a smidge; enough to have some give without them sagging or stretching out over the day. They’re fairly highwaisted, and really comfortable. The thighs and hips aren’t constraining, and there’s some gathering around the knees so they’re skinny-fit without that jeggings effect that you can sometimes get. I could live without the zips that sit right out the curve of my belly, but apart for that I’m really happy with them. Thanks Jo – One of my favourite combos too! Well, yellow and ANYTHING, really! OMG THANK YOU LILLI!!!! I LOVE this shirt but was a bit turned off by the $45 price tag!! BUT thanks to your info about the sale – straight over there and BOUGHT!! Also bought the wifey top – although my other half is more of the wifey!!! 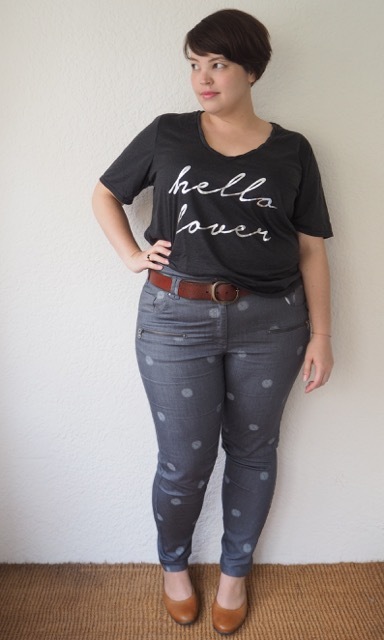 You look fab as usual and LOVE it paired with the Carmakoma jeans!! They look great on you. Brillo #bigthanks! Oh Lili, you look gorgeous with your hair short! I had to scroll back through some posts to see if I’d missed a haircut or if you just had it pinned up! I do love these outfits, but your hair has really done it for me today. Gorgeous, chic, and fun. Where have these Ts been all my life? So happy you found them! 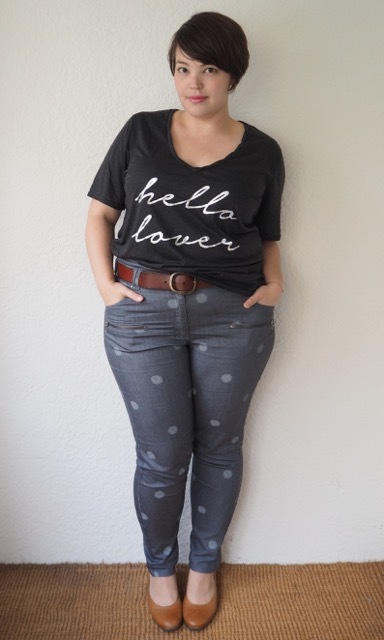 I am a jeans n t shirt kinda gal but always have loads of trouble finding funky ones in good sizes…they’re either too short in the bod or, like the Mink denim ones in Myer, super cute prints but really short sleeves! These look so awesome, and it looks like they have a 5 for price of 4 promo on top of the sale price…I might have bought 5! ???????????? After years of trying, I’ve given up on ever being able to pull off a half tuck tee. I just can’t do it like the cool kids can. 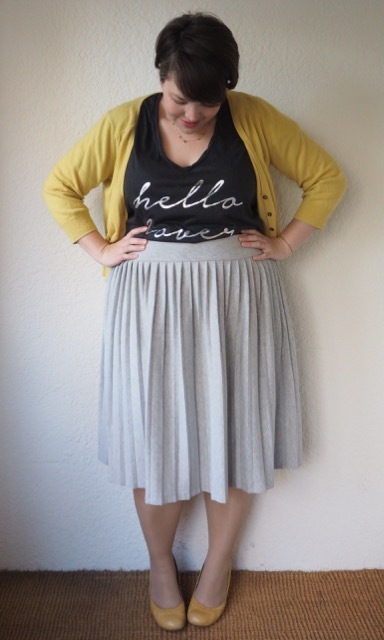 So I embrace the full tuck and am especially loving pairing a tucked tee with a skirt and tights for autumn.